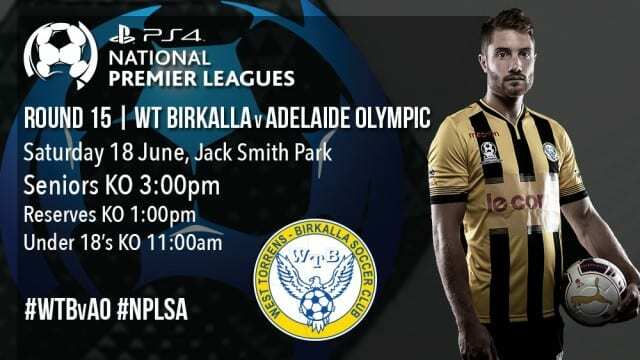 West Torrens Birkalla twice came from a goal down to rescue a point against Adelaide Olympic as the two sides played out a thrilling three all draw at Jack Smith Park on Saturday. Fumiya Suzuki opened the scoring for the home side with a sublime strike inside the first five minutes, but that was cancelled out by Fausto Erba to keep the scores locked at the break. Matthew Bouzalas gave Olympic the unlikely lead not long after the restart, which quickly evaporated as substitute Michael Mangafakis again evened things up with an opportunistic strike. Oliver Totani put the visitors up 2-3 with a goal to rival Suzuki’s opener for best of the bunch, but there would be another twist in the tale as youngster Charlie Rhodes stepped up on his debut to ensure a share in the spoils. “We had the opportunity to catch Campbelltown and stay in close contact with City. The Novar Garden’s club came into the contest with the best defensive record in the competition and after conceding three, Nagel gave full credit to Olympic for getting their tactics spot on. “To concede three goals was very disappointing as we have been defensively strong all year, but I guess on the positive side we scored three goals and came back twice when down which shows an attacking force and determination. “I think Olympic did a fantastic job at realising that we are a ball playing team and closed space and put pressure on consistently at high intensity throughout the whole game, they didn’t allow us to play the game we wanted. Olympic’s Chirs Mara was happy with the way his teammates bounced back from a tough loss, but admitted it was “very disappointing” not to have taken more from the game after twice holding the advantage. “It was a hard and physical game, we knew we were going to have to put in 110% as a team if we were going to get a result. “Birkalla are a good side but we proved that we can match it with the teams inside the top four. Despite an improved performance, Mara believes that the game still showed areas in which Olympic can improve, particularly on the defensive side. “We are a team very capable of scoring goals as we have shown, but I don’t think it’s a matter of having the firepower up front to make up for our defence, but more so an area we need to work on as a team defensively. “We have a couple of hard weeks of training ahead of us to prepare for Comets which I’m sure will be another very hard game. The opening few minutes of the game perfectly set up what was to come over the 90 minutes, with both sides spurning golden chances to open the scoring. First Suzuki whipped in a dangerous cross from the left which was almost put in for an own goal, then his opposite number in David Signore crossed low across the box with a ball that was begging to be hit, but Olympic’s strikers could not get anything on the end of it. Seconds later the ball was back down the other end at Suzuki’s feet who cut in from the left and performed a couple of step-overs, leaving the defender in his wake as he curled his shot beyond the reach of Gino De Lucia into the top corner at the far post. Olympic’s intensity rose at this point as they attacked down the right hand side, giving the usually rock-solid Birkalla back four headaches. The visitors were awarded a free kick at the 15 minute mark, where Fausto Erba was found alone in the 18 yard box, who headed low and beyond Julian Torresan to bring the scores back level. Both sides had chances to take the lead for the remainder of the half but couldn’t finish. The second half started in similar fashion to the first, with a dangerous free kick from John-Paul Cirillo almost being put in for an own goal after an attempted clearance rattled off the cross bar. Bouzalas gave Olympic their deserved lead on 52 minutes, after he was played in down the left hand side and finished tidily into the back post. Their lead didn’t last for long though, as the ever-dangerous Suzuki played in a cross that evaded everyone, falling to Mangafakis who fluffed his lines and fired straight at De Lucia but grabbed the rebound for the easy finish. Managakis saw plenty of the ball out on the right for Birkalla towards the middle of the second half, but lacked the final product to trouble the Olympic defense. Birkalla looked to have the upper hand at this point, but a mistake in the middle of the park allowed Olympic to capitalize as Totani was played in down the right hand side, and in similar fashion to Suzuki’s opener, cut in and curled his shot in at the far post. Totani’s passion spilled over as he took his shirt off in celebration, earning himself a yellow card in the process. Birkalla again increased the pressure and their intensity as they sensed the game was beginning to slip away, but a stroke of luck found themselves back in the contest. Debutant Rhodes, who came on as a second half substitute, attempted to keep the ball alive after a poor cross was met with an even poorer clearance attempt. His flick had just enough power behind it to loop over De Lucia’s head and nestle over the goal line to tie the scores up once again at three apiece. Both sides threw caution to the wind in the last few minutes in an attempt to steal the win, and it almost payed off for Olympic as Totani rounded Torresan and appeared to be through on goal, but the ever-reliable Tom Ditmar closed the gap and cleared what should have been a fourth. Rhodes was presented with a glorious chance to make his debut even more memorable in the dying seconds as Taro Kawamura squared off to the youngster, but he couldn’t keep his shot down as the scores remained even.